Early in the morning after having breakfast, you will take a city tour of New Delhi including Laxmi Narayan Temple - The Place of Gods, India Gate - The memorial of martyrs, drive past the Parliament House - The Government headquarters, Lotus Temple - the only Bahai temple, Humayuns Tomb : built in mid 16th century this is an early example of Mughal architecture and Qutab Minar. In the afternoon after having lunch, we will enjoy city tour of Old Delhi including Jama Masjid - The largest mosque in Asia, Red Fort - The red stone magic, Gandhi Memorial - The memoir of father of the Nation. We will also enjoy sound and light show at Red fort. Overnight stay at hotel in Delhi. 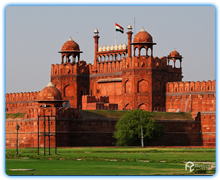 Early in the morning, you will be transferred to Agra with our tour guide and driver. After arrival first we will take a rest at any luxury hotel and then visit Taj Mahal(Taj Closed on FriDay), Emperor Shah Jahan declared to honor his wife Mumtaz Mahal with this memorial of unrivaled beauty when she died and then Agra fort is a authentic jewels of the Mughal architectural tradition. The different kinds of buildings within this fort multifarious represent the different cultures, which was the trademark of the Mughals. Overnight stay at hotel in Agra. 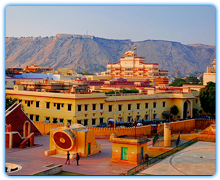 Early in the morning, we will drive to Jaipur which is also called the "Pink City" of Rajasthan. En-route visit the Fatehpur Sikri which is built by great Mughal Emperor Akbar, as his capital but after few years discarded due to shortage of water. Overnight stay at hotel in Jaipur. On the forth Day of this tour after having breakfast, we will enjoy whole Day to visit most attractive places of Jaipur. First of all, we will start our traveling from Amber Fort where you will ride like a king or queen on elephant's back. Instead of this, you will visit many sightseeing tour of the city of Jaipur including a visit to the City Palace, where you can see Chandra Mahal, Shri Gobind Deo Temple and the City Palace Museum; Jantar Mantar, a royal observatory with granite excessive instruments; Hawa Mahal, a five-story structure with honey-comb charade and visits to the famous carpet factory and jewel factory, where you can see accomplished artisans doing complicated work of jewel cutting and polishing. Overnight stay at hotel in Jaipur. Early in the morning after having breakfast, we will drive to Pushkar. After arrival Pushkar, First you will be transferred to luxury hotel and then we will enjoy the fun n cavort of the eminent Pushkar fair. Overnight stay at hotel. On the seventh Day of this tour, we will enjoy full Day to visit the Pushkar fair and local area. Finally we will take a overnight stay at hotel. Early in the morning after taking breakfast, you will move to the "Lake City" of Rajasthan, Udaipur. After arrival Udaipur, first you will be transferred to hotel where you will take a lunch. In the evening time we will enjoy the Boat ride in Lake Pichola, The charming lake that spellbound Maharaja Udai Singh. The lake is bounded by hills, palaces, temples, bathing ghats and mounds. Two island palaces, Jag Mandir and Jag Niwas on the lake are of awe-inspiring. Overnight stay at hotel in Udaipur. Early in the morning, you will be transferred to Jodhpur, en-route visiting the beautifully engraved Jain temple at Ranakpur. After arrival Jodhpur first will take our lunch and then visit the Mehrangarh Fort which factually means "Majestic Fort", situated at the very centre of the city. You will visit strengthen the fort. It has a collection of musical instruments, palanquins, furniture and cannons on the forts' fortifications are well conserved. Jaswant Thada: Close to the fort complex lies this white marble monument, which is built in 1899, in memorial of Maharaja Jaswant Singh II. Overnight stay at hotel . 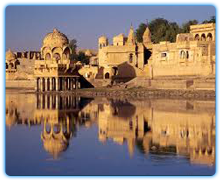 Early in the morning, you will be transferred to Jaisalmer, the 'Golden city' of Rajasthan. After arrival Jaisalmer first you will be transferred to the hotel and take relax. In the after noon you will post lunch at leisure to walk through the streets of peaceful and attractive Jaisalmer. Overnight stay at hotel . Early in the morning after having breakfast, we will move to Jaisalmer Fort, the Gadsisar Lake, royal cenotaphs and Jain temples. In the afternoon after taking lunch, you will visit to Sam, for an experience of the easygoing sand dunes of the Thar Desert. In the evening time you will enjoy Camel riding in Desert. Overnight stay in Jaisalmer. Early in the morning, you will be transferred to Bikaner. After arrival first you will be shifted to a luxury hotel where you can take some relax. In the afternoon time, you will visit the Junagarh Fort, which is also known for its marvelous interiors and the camel proliferation farm of Bikaner, the only one of its kind in Asia, presenting a unique experience of the company of hundreds of camels. Overnight stay at hotel in Bikaner. Early in the morning, you will move to Mandawa in the Shekhawati region. After arrival first you will be shifted to a hotel and then you will make a walking tour of Mandawa to visit some of the beautifully decorated manors of the town and experience the lifestyle of the royal families in the past. Overnight stay in Mandawa. On the last Day of this tour, you will drive to Delhi, followed by drop at the international airport for flight back home.